I know the power of being a connected educator and I want more people on my campus to experience the spark that a PLN can ignite. I think they just need a little push so here I go jumping into something and flying by the seat of my pants again. Many of the teachers on my campus are taking baby steps out of their technological comfort zones and I would like to find a way to acknowledge and encourage them. I think digital badges might be a fun way to do this. I told them they could earn these badges and then print them out to display in the classroom and/or post them on their blogs and I asked them to email me back if this is something that might interest them. I received quite a few "Yes!" responses and so it was something I had on my "to be continued" list. which got me thinking about it again. I went back and reread the articles and tweets I had saved and got to work. I reread "Building a Better Badging System" by Marc Toner and Alice Keener's "Creating Badges with Google Sheets" . Then Shawna Ford tweeted out a link to her blog post about "Professional Learning Options" and badging which pointed me to more models. So I think I have a working (in-progess) system to offer teachers. 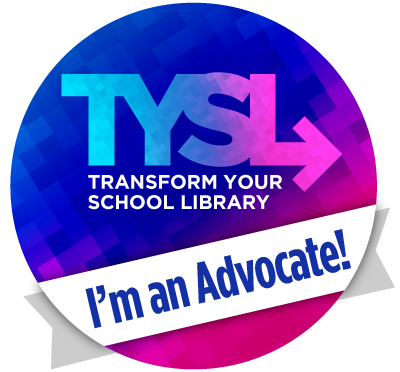 I have created a page on my library website where I will post the different badges they can earn and a link to a google form they can fill out to request the badge. I will receive an email when a form has been submitted and then through credly.com, I can "send credit" to them where they can then print and/or display on their blog by following these directions. I am going to cross my fingers and hope I have thought this through. Lucky for me my teachers are pretty flexible so if I screwed something up they will patiently wait until I can figure it out. I am excited about this and am looking forward to seeing how badges might fuel growth at my campus. I would love to to hear any ideas about badging or how you have used digital badges with students or teachers. Looking forward to earning badges :-) I've been slacking on technology a bit this year and need a little fuel to get me going!